I’ve used this simple booklet with a range of classes and it just works! Many thanks to my former colleague Nick McIvor for creating it and sharing it. 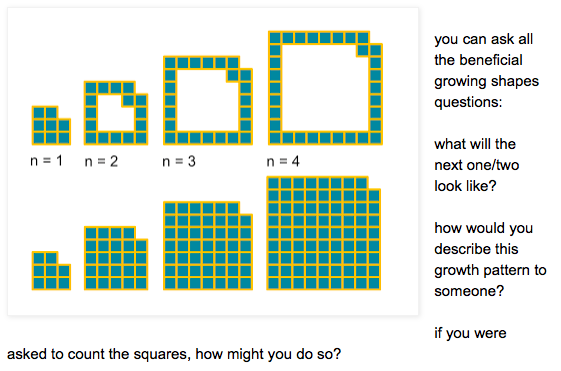 A well structured set of examples that enables students to see the patterns. I would still teach the nth term more formally after using this, but it’s a great introduction and it builds confidence. In common with most Maths teachers, I love Don Steward’s site Median for the fantastic range of quality resources and ideas. All the ideas in post come from here. I have taken some of them and put them into a PowerPoint with some solutions. As teachers, we should do the Maths that we are asking our students to do in lessons. Which is, I guess, why most of the resources on Median don’t have solutions with them. However, in the midst of a busy term, lesson planning has to be time-efficient and so I have added a slide in here with some possible solutions (there may be more elegant options). The idea being that lesson planning is then a case choosing how to present this and involves deleting pieces of this solution which is much quicker that creating them from scratch. After browsing the ever excellent Don Steward’s Median site for sequences, I found this on Linear and Quadratic growths. It got me thinking about using shapes to represent sequences and in particular using different colours to represent different sequences laid on top of each other. For example, the following patterns produce a linear sequence. However, there are a couple of ways you could look at this which combine sequences which are arguably simpler. We can then extend this on to quadratic sequences. 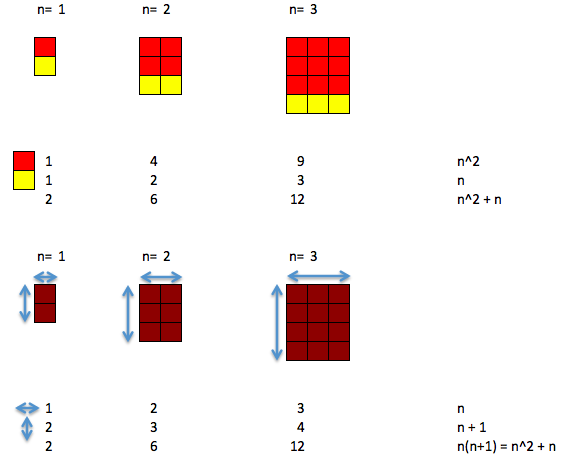 This is nice: one way we can see the sequence of square numbers, the other way we can see how multiplying one dimension by the other leading to some brackets which can be multiplied out. There are a bunch of these in this file. 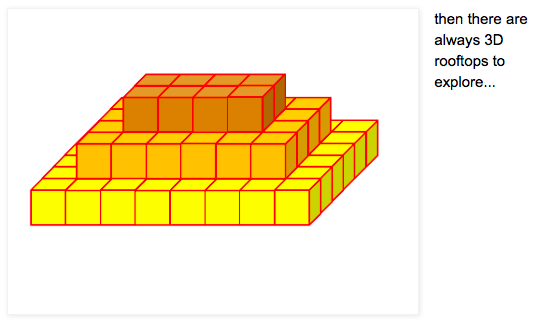 There are also over a hundred sequences at visualpatterns.org a website entirely dedicated to, well, visual patterns. Get your students to create their own once they have got the idea. Could make for some great wall displays! On quadratic sequences specifically, a nice worksheet here from @solvemymaths. Finally, back to Don Steward with this which is actually just a series of terms stacked on top of each other.